Responsive Design - The Who, Where & What? Home > Blog > Web Design & Development > Responsive Design – The Who, Where and What? Who should be listening to responsive design messages, blogs, posts etc? Basically, if you have a website the answer is you, this impacts anyone who has a business represented online. The stats in South Africa are staggering in terms of the number of cell phones in this country. The last figure was presented in 2011 and the number of mobile phones was 59 million compared to the 50 million people in South Africa. Many of these mobile phones will now be smart phones and that means they will have access to the internet. Mashable recently said this about mobile traffic, “Meanwhile, the shift to mobile is happening at an extraordinary speed. Today, 30% of Mashable’s traffic is mobile. By the end of next year, this may exceed 50%.” The figures should really be a cause for concern if your website is not mobile friendly. 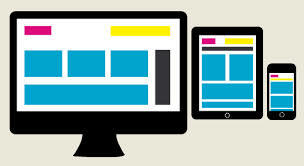 Where exactly does responsive design play a part? The devices we should be aware of are tablets and mobiles. Tablet sales are set to skyrocket with projected figures of 100 million tablets to be sold in the US this year. As we know smart phones are everywhere so we need to match our marketing to the devices people are using. Unfortunately a lot of websites are not mobile/tablet friendly and end up looking terrible or are not user-friendly when viewed on different device screens. Responsive design isn’t just for mobile phones and tablets, it is also for adapting the view on pc browsers and laptops so that users can view websites with ease. What is exactly is responsive web design? It all sounds great so far but what exactly is this functionality and how easy is it to apply to your website? “Back in the day” people built mobi sites which would appear something like m.mjmedia.co.za and that would have represented our mobile website and shown to people searching on their mobile phone. Now our website URL doesn’t change it is www.mjmedia.co.za and the responsive design code that is implemented on the website is used to determine how to show your website depending on the different device or browser people are using. The responsive design method can be applied to most websites by a web developer and any good web developer will build any new websites responsively. Make sure you ask the right questions when building a website or alternatively ask a web developer if your current website can be upgraded. Remember to keep your website updated especially if it was built more than three years ago, it probably needs a refresh and this can be done in line with making it more responsive. Why have responsive designed websites?